So many SF novels, particularly first novels, seem to be built out of novellas these days that you'd think it was the forties all over again. (And, yes, you can always see the joins, even with the most skillful writers.) Singularity's Ring is one of the more elegant examples, but it can't hide the fact that the first few chapters really are episodes, and nearly separate stories from each other. Maybe I'm exaggerating -- the characters are the same, the background is the same, and the chapters follow very quickly in time. And maybe I only notice it because the copyright page alerted me that the first two chapters were originally published as the separate stories "Strength Alone" and "Singletons in Love." It's a hundred or so years in the future, and most of humanity is gone. One faction -- presumably the highest-tech First World types -- formed an AI-mediated Community, burned through a frighteningly speedy technological growth spurt, built a Ring around the earth complete with a number of skyhooks, and then all keeled over dead, presumably uploaded to the Singularity. Soon after, or at roughly the same time -- and maybe caused by someone falling over in a lab; it's not clear if anyone knows -- the Gene Wars began, and vast numbers of people died in that, as well. 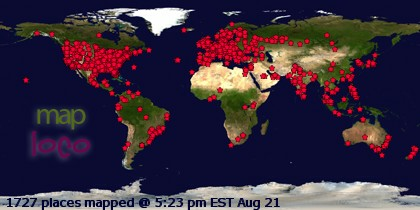 When everything settled back down after the die-offs -- this is yet another vaguely Utopian medium future that we can only get to by killing off 90% of the human race, and it's depressing that we're still getting those after the glut in the '90s -- the world was left as a number of insular communities, either deliberately denying modern technology or isolated enough never to have gotten it, and one dominant faction that had been genetically engineering humans into "pods." Melko never explains how or why this happened, but the appeal of pods -- each a group of two to five humans who function as a unit, tempering each others decisions and always seeking consensus -- is obvious in a world destroyed by war and sudden death. A pod is a radical form of personal democracy, the person as polity, linked by pheromones and a shared history into the legal person of this new society. Pods started out with duos, then trios. When Singularity's Ring opens, quints are cutting-edge technology, with only a few "prototypes" growing towards maturity. One such quint is Apollo Papadopolous -- Strom, Meda, Quant, Manuel, and Moira -- training in a Rocky Mountain location and competing with several similar groups to be the captain of their society's first starship, the Consensus. Perhaps they'll even be the whole crew; Singularity's Ring occasionally takes note of the fact that its "people" take up more space, need more resources, and can do more jobs simultaneously than current individuals, but only in passing -- that people have two to five very different bodies is normal in this world, so the accommodations to that fact aren't remarked on. The first five chapters of Singularity's Ring are each narrated in first person by one of the members of the pod, so we get to know them as individuals as well as pieces of Apollo. A pod isn't really a hive-mind; it's the combination of all five working together -- it doesn't have thoughts separate or "above" its components, but is formed by all of them thinking together. The core of the pod philosophy, as we see many times in Singularity's Ring, is that word "consensus." I can't be sure that pods were created to avoid rash, runaway decisions like the ones that sent the Community off into wherever-they-went, but it certainly seems that way. So we get to know Apollo, in all of his/her facets, and we get to slowly know his world. (I had big questions about this world that weren't answered until late in the book; I mention that in case you, too, read it and start wondering about some big things early on.) The book doesn't go in the way the flap copy would lead you to expect, though the title is a big clue. As often happens in near-future SF, Singularity's Ring is finally about How We Got There, and our protagonists end up being a very, very important person indeed. There's danger and intrigue, and even something like a love story -- those of you who have read "Singletons in Love" will know that my "something like" is meant very loosely -- as the parts of Apollo learn the deep dark secrets behind their world. 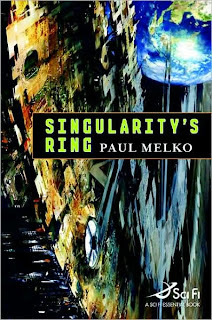 I still think the world of Singularity's Ring is weird and only vaguely plausible, but Melko doesn't present it as something perfect and shiny, or as the only possible future, which makes it that much more believable. His writing is compelling, and his viewpoint characters subtly different from each other. I do wish that SF novels didn't feel compelled to answer all of the questions of their settings -- spy novels usually don't devolve into geopolitical explication -- but mine may be a minority taste. Singularity's Ring is a fine SF novel, substantially better than most first novels, and I'm looking forward to what Melko does next.